Credit: Scanned by Cain DeVore. Taken by Trane DeVore. Although his house was not far away, DeVore, 66, chose to spend his final time at the converted chicken coop that was his studio and, in many ways, his home. In his lifetime, DeVore mapped much musical terrain, beginning with a stretch as a jazz pianist in his native Missouri, a peek into San Francisco’s psychedelic music scene during the 1960s, and turns as a self-described “itinerant flute-maker” and respected creator of experimental music and the instruments upon which it was played. DeVore studied music privately with a tutor. As a pianist, he became a fixture in the Missouri jazz scene and buttressed his musical education gigging in nightclubs. “Bass player Al Viserca took me to Chicago to introduce me to the jazz scene there and some real players,” DeVore reminisced to his son shortly before his death. “There I discovered both drugs and my musical limitations. I returned to Kansas City and checked myself into the Conservatory of Music, where the great George Salisbury taught me theory and chord structure. “George wanted to hear where I was at as a player, so he asked me to play him something. I threw down some standard, and I played it well because I was already a respected player locally. But I played by ear. The maelstrom of musical innovation in 1960s San Francisco drew DeVore to the coast, where he clocked time at the keyboard with seminal psychedelic rock outfit the Charlatans (of which Dan Hicks was also a member), the lesser-known neo-primitive group Pygmy Unit and numerous other musical endeavors. As a Charlatan, DeVore recorded for Mercury Records, but the band dissolved soon after. In the aftermath, DeVore was courted by a major recording label for a pop solo project but was put off by the industry’s marketing machine. He strolled out in the middle of a meeting with the label honchos. “I walked out of there into a real nice sunny day in San Francisco. I said, ‘That’s it — no more commercial music,’ ” he said in a previous interview. DeVore turned his attention to his own compositions as well as creating instruments, including his popular “wind wands” (twirled wooden devices that suggest the sound of a didgeridoo) and the bamboo xylophone. Through much of the ’70s he was known in the Bay Area music community as “the Flute Man” for the hand-tooled bamboo flutes he created and peddled at arts fairs and music events. DeVore accrued several monikers during his career, among them Dr. Um, shorthand for “Doctor of Universal Music,” and “Mr. Sound Magic,” his preferred appellation with students in Petaluma public schools, where he frequently made appearances to introduce kids to sounds and musical notions not in the curriculum. Many of DeVore’s musical instruments are being donated to North Bay schools. “The music never stops. You just can’t always hear it,” DeVore remarked on more than one occasion. Cain DeVore is seeing to that notion by digitizing his father’s copious archive of original music to make it available online at Dr-Um.org, a Web site set to launch later this month. He is also organizing the writings and drawings generated by his father as well as photos and documentary footage of him. The family intends to make the collection available to scholars and fans. By that token, Universal Music is represented in hundreds of recordings (among them DeVore’s live solo piano performances on Berkeley’s KPFA radio station), appearances with various groups, including the Lingua Quartet with his second son, Trane DeVore, a poet and professor at Japan’s Osaka University. It’s easier to identify Universal Music as a philosophy than as a sound. At times it shirks the conventions of Western music, edging toward avant-garde with a primitive aspect. 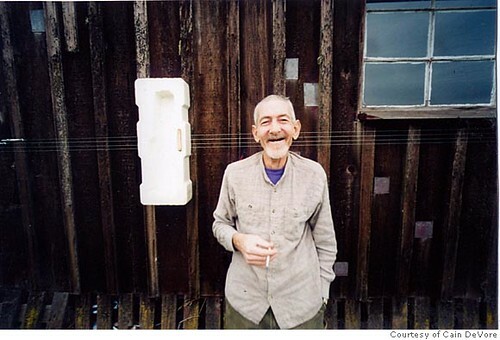 In the past decade, DeVore had been exploring an improvisational style of composition, often in the company of several collaborators, among them Tom Waits, experimental instrument pioneers Bart Hopkin, Richard Waters and Tom Nunn, as well as musicians Mike Knowlton, Zeno and Steve Shane. “I’m not into nostalgia. So I never play anything twice,” DeVore once said. It was an apt summation of his trajectory as an artist and one of the many koan-like aphorisms he was known to make. DeVore is survived by his sons Cain, Trane and his daughter Oma DeVore, his sister Marjie Sansone and brother Glenn DeVore. A memorial for Darrell DeVore will be held at 4 p.m., Aug. 27 at Studio Um, 602 Cleveland Lane in Petaluma. Friends and fans are welcome. Looks to me like you’re having tons o’ fun. f you or anyone else in the family wants the reel2reel tapes, get in touch. Gene — That’s totally awesome of you to post those sessions. I’ll make a link to them in the side column, and to your music blog in general, and I’ll also write a little post to that people have easier access to the link. I came across your blog searching for information about your father Darrell. I´m doing some research about the band The Charlatans. Although the heyday of the Charlatans had already been over, I absolutely love their sole album, to which your father contributed four songs. The songs from your father´s pen are quite exceptional and much to my dismay I learn that he turned his back to songwriting and the recording business in general. I can absolutely understand his feeling of freedom when he walked out of the record company office right into a bright sunny day never to return again (I did the same thing once in Obama, north of Kyoto, leaving a Zen temple in the middle of December´s rohatsu sesshin). But I have always been a pop fan and especially a fan of good songwriting. A whole album recorded by your father in the early seventies would be something I´d definitely love to hear. Too sad it didn´t happen. So, anything you remember your father saying about his time with the Charlatans would be interesting for me. And also, if you have any recordings of songs more or less in the pop vein done by your father, I would love to hear them, although it doesn´t seem very likely. By the way: I live in Munich, Germany. I´m a musician (pop, folk) and writer. I have studied Japanese and spent a couple of years in Osaka and Kyoto, and have been married to a Japanese woman for 10 years. In the last couple of years my bonds to Japan have become thinner, unfortunately, but my love for this country is still alive. This is really just a coincidence. But your blog is great! I read a little bit and there´s a lot of interesting information to find. I also like your style of writing. I will definitely take my time to read more. Well, at any rate I would be thankful if you´d respond to my mail (this is actually not meant as a comment but a personal mail, but I don´t know where to send it to). I’ve already sent you a reply via regular email. Thanks for dropping this comment — it’s always nice to find people who are interested in my father’s history with the Charlatans. Of course, he may have turned his back on the music industry but he certainly never turned his back on music itself; in fact, music was the defining passion of my father’s life until the very day he passed away. In any case, good luck with your research. I’ll be interested to see any essays or other writing that comes out of it!